Alderholt Mill Self-cateringModern conversion of old working water mill "Mid-Mill" and "Millers End" are two ground floor apartments sleeping 2 only. "The Granary" is a large open plan first and second floor apartments with 2 double bedrooms large unusual sitting room, 2 bathrooms, air conditioning. Sleeps 4-6 persons. Swimming 2-5 miles, Gym 2 miles and Public Houses 1 1/2 -2miles. electric fires. Electric paid by coin meter or meter reading. Electric cooking. Non smoking. Children welcome from age 8. 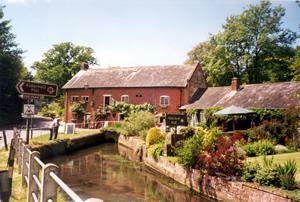 Alderholt Mill offers weekly bookings starting on Saturday. From the M27 junction 1 take the B3078 across forest road to Fordingbridge. Over bridge, turn left at mini roundabout into High Street. At top bear right to Sandleheath. Pass the Post Office and at next junction turn left 1/2 mile over river bridge. Mill car park will be on your left, Mill and appartments on your right. Loved my stay here, the cottage is well equipped, clean and comfortable. I was made to feel very welcome, Sandra was extremely friendly and helpful. I will be booking to stay here again.